Two of World Superbike's most beautiful grid girls, Jitka and Petra are featured on the Cover and inside Garage Girls 2014. Almost all the girls are professional models booked through local model agencies in the respective host race countries. But at many of the European rounds the same Czech girls are provided through an agency named www.PetrasAngels.com which is based in Prague, the Czech Republic. 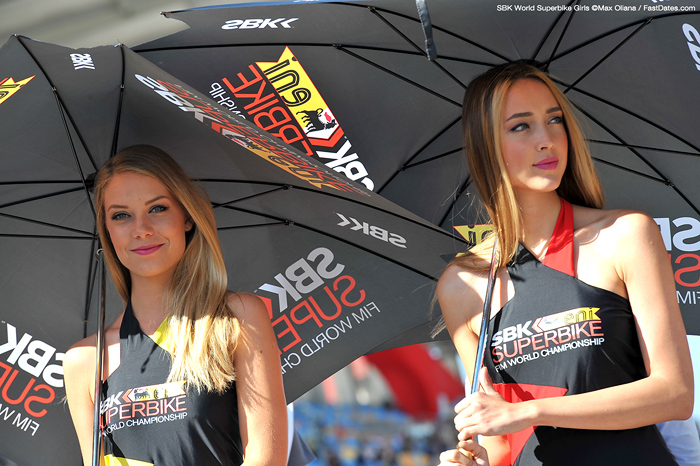 You'll immediately recognize two of the most strikingly beautiful tall Blonds Petra and Jitka, as always being featured at the front the the SBK starting grids in Europe because of their matching looks and tall 5' 9" height which is exasperated even more with their 5-inch heeled boots. We are excited to have contributing photographer Max Oliana photograph Jitka and Petra for us for the 2014 and 2015 editions of the Fast Dates World Superbike and Garage Girls Calendars. At the SBK World Superbike rounds in America the official SBK girls are provided by the agency UmbrellaGirlsUSA.com and by our own FastDates.com Calendar photographer / publisher Jim Gianatsis who always hires and brings to the year's featured Calendar shoot round, the most beautiful models he can find. These special Calendar Kittens will shoot with Jim and all the top factory race teams' bikes on Friday / Saturday Practice Days for the Fast Dates Calendar, and then on Saturday Superpole / Sunday Race Day the models change from bikini swimsuits into the official SBK uniforms for their World Superbike Starting Grid and Podium duties. Jitka on the Starting Grid this race as the official SBK Alfa Romeo girl. The Eastern Bloc Countries have some of the most beautiful girls in the world, as evidenced above by this official SBK girl in Tissot Watch Superpole uniform at the Moscow Raceway round in 2013. Above and Left, beautiful SBK Czech mates Jitunka and Petra are featured in the 2014 and 2015 FastDates.com Calendars and in Members Corner. Above, Jitka and Petra shake things up in in the 2014 Fast Dates World Superbike Calendar. Laguna Seca SBK World Superbike 2013 featured FastDates.com Calendar Kittens Jessica and Halle (above left) as the official SBK Grid and Podium Girls, and Hannah (above right) as the official Aprilia Umbrella Girl for factory rider Sylvain Guintoi. Below, Hannah and Jessica get up close and personal with Jonthan Rea's factory Ten Kate Pata Honda CBR1000R Superbike featured in the 2015 Fast Dates Calendar.